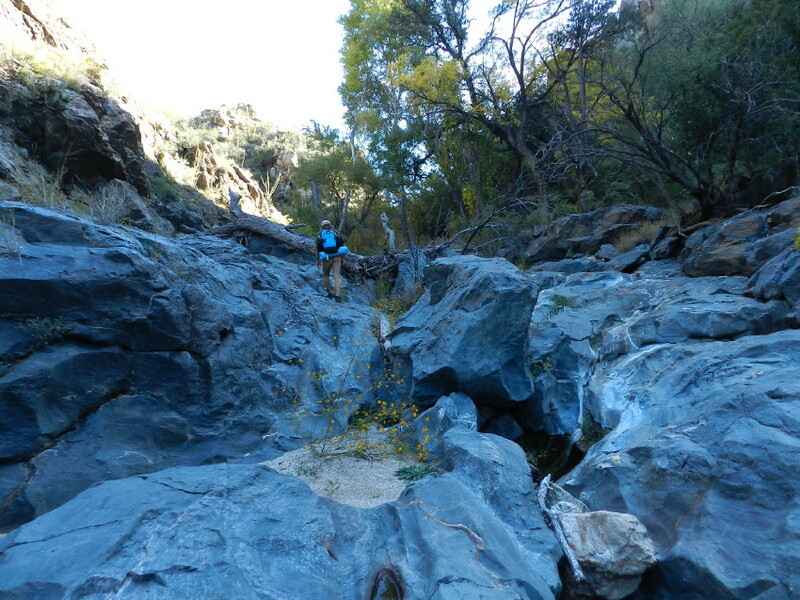 When we left off last time, we were on our way down a thin remote canyon in the area of Happy Valley. Our friend Bruce, who is leading us, has told of several fun things back in there and to expect some mild Canyoneering. REMEMBER you can enhance any picture with a click. We now continue through this geologic playground, right where we left off last week. 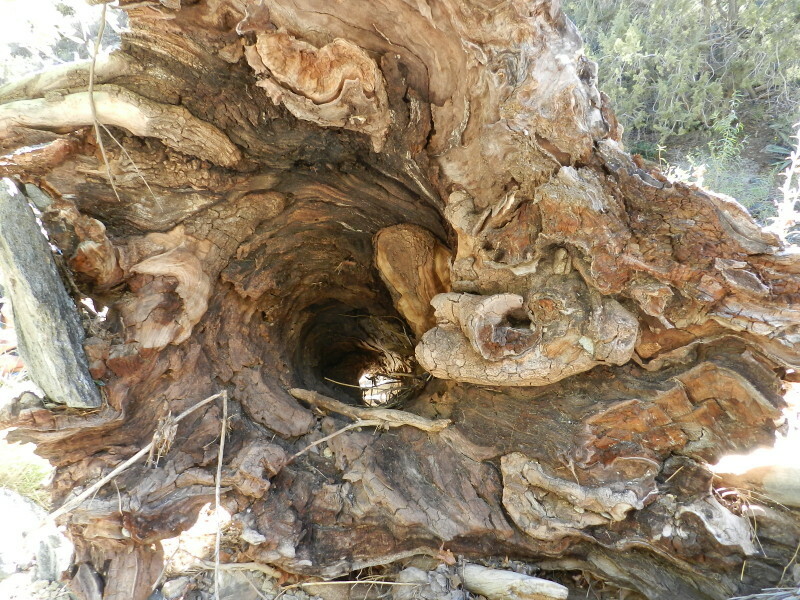 Along the way we discover downed hollowed out swirled trees and exposed roots. We see just above us, what I think is a log sticking out of a hole in a cliff. 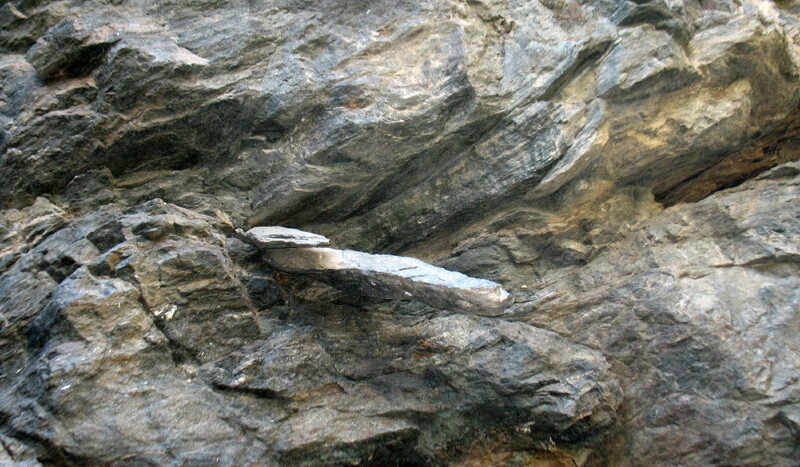 It is actually a slab of stone about six feet long. It just fell and got hung-up, wedged there. 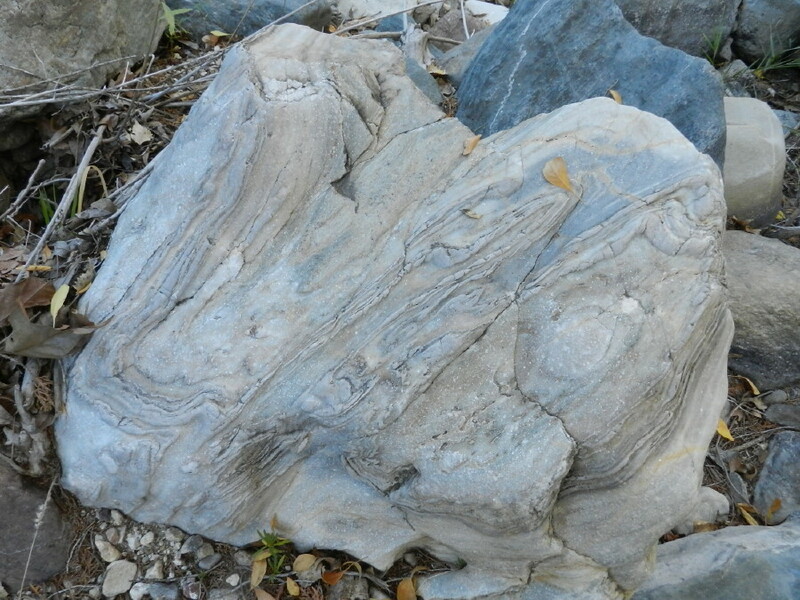 There is a plethora of geologic fun. He had mentioned a wall of rainbow marble. 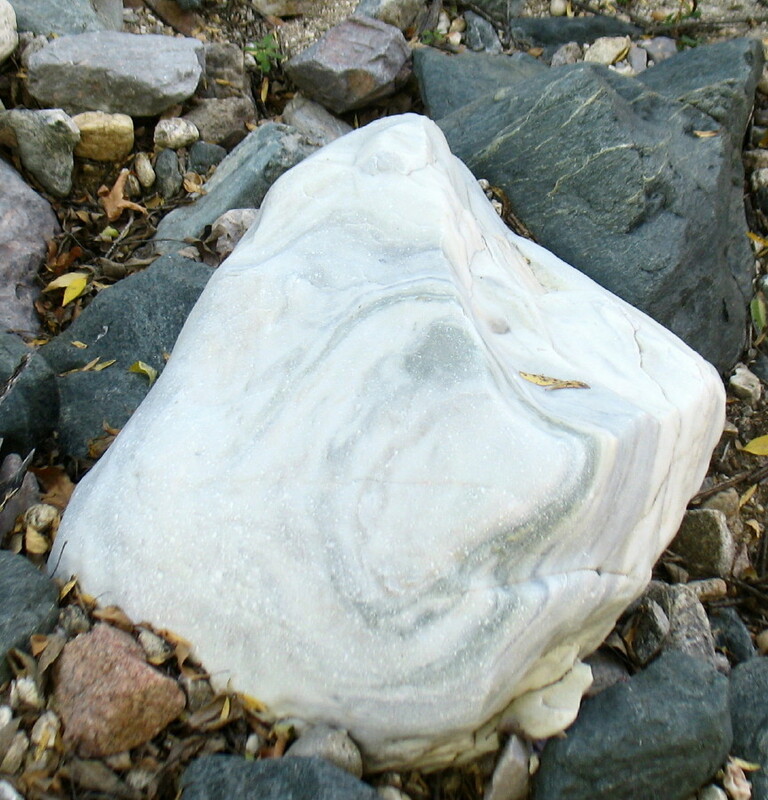 Southern Arizona isn’t particularly noted for having marble, but we keep coming across variously sized specimens of marble in many colors. They stand out, contrasting like night and day sitting in a frame of black surfaces. They are like art, as the colors swirl through them. I begin to think that I’d love to see the marble wall, but it becomes evident that we won’t get that far today. It is best to camp out and get up early to explore this place. 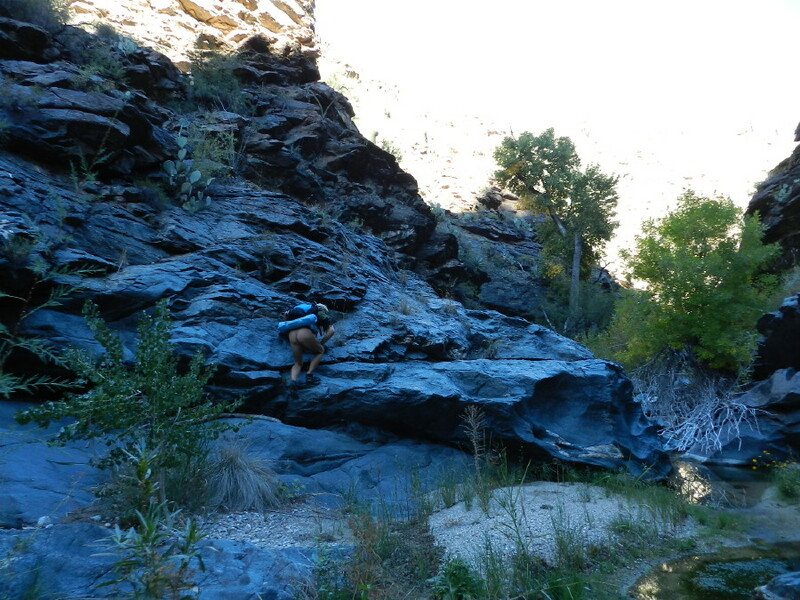 Eleven miles of canyoneering will take all day. This afternoon, we may just travel a rigorous two miles and then back. We eventually arrive at a wobbly bluish black slab of hard stone. It is all shaded and its shape flows like water. 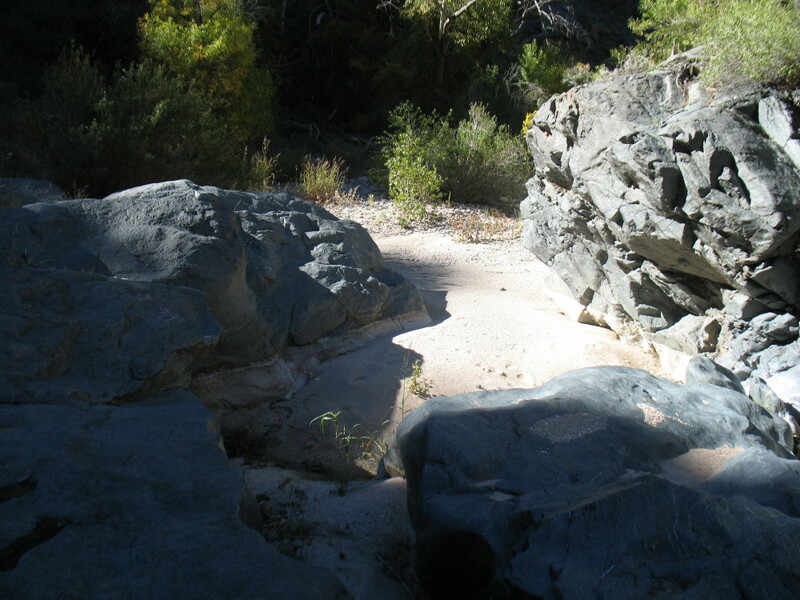 This narrow spot opens up to a very tall dark brown rock face, with saguaros dotting it with their green contrast. We find Bruce is laid back leaning on the smooth surface, smiling in peace. Below him is a dry sandbar. There is a white line like a deep bathtub ring where the calcium has built up at the waterline. 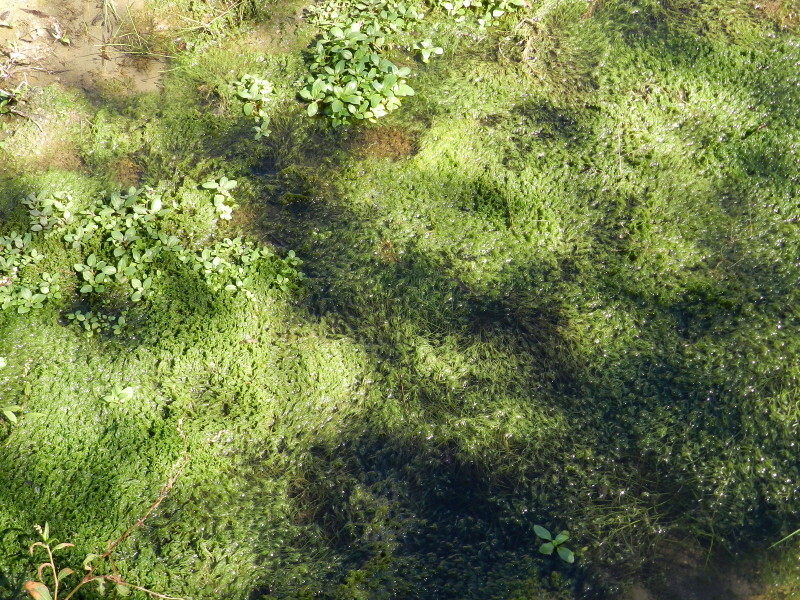 He tells us that this is the swimmin’ hole that he has been talking about. There will be no swimming today. It is bone dry. Bruce explains to us how he once found a tent camp just beyond here. On another day, it is a wonderful spot. 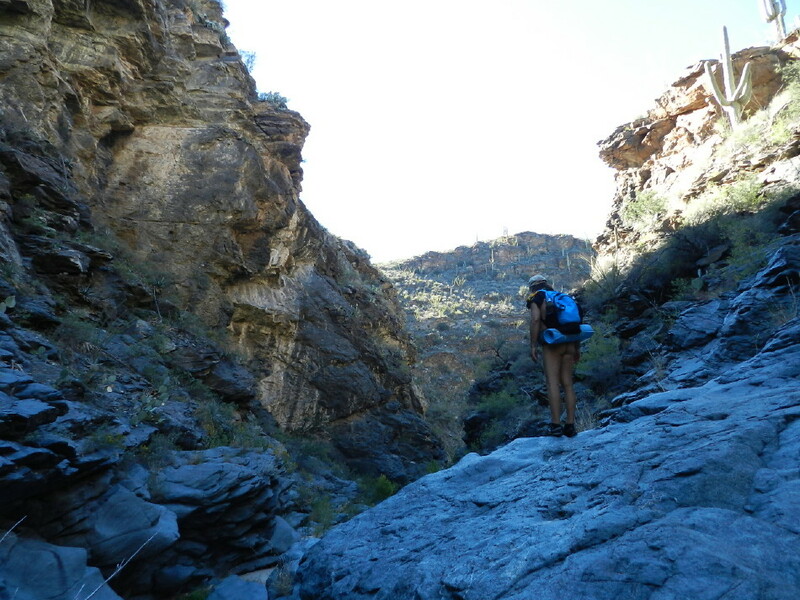 One thing is certain, this canyon isn’t frequented by many. There is no evidence of anyone, usually not even the cattle. It is filled with natural wonders, and its own character, but few know to enjoy it. Near the road through Happy Valley, there are many wonderful places before arriving at the beginning of this place. They are more easily accessed, with more water and trails. They all distract people from this wilderness. 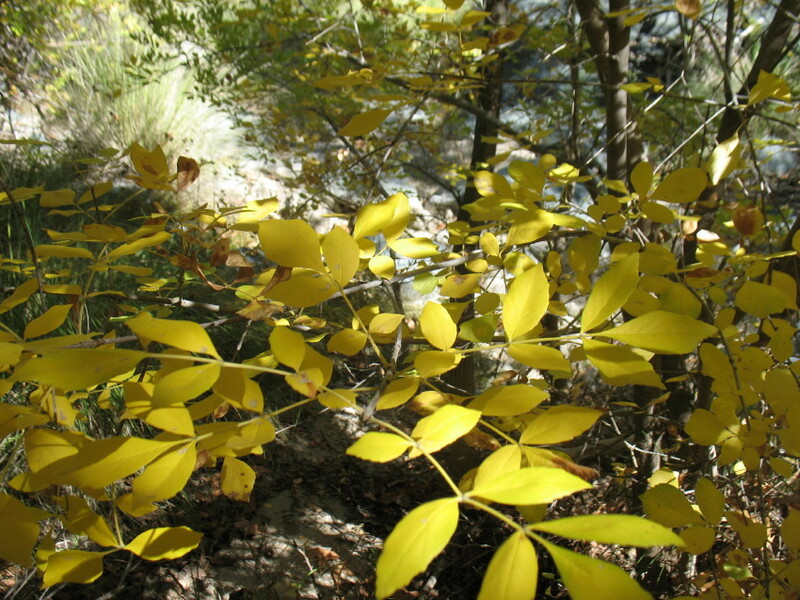 He tells us that further, where “the really good stuff” is, it is much rougher and more dangerous climbing. Perhaps, on another day. We will relax here for a while, eat, enjoy the cool black stone on our bare bodies. We want to get out of here before nightfall and the cool air. I realize that I have absolutely no clothing. It could become uncomfortable. 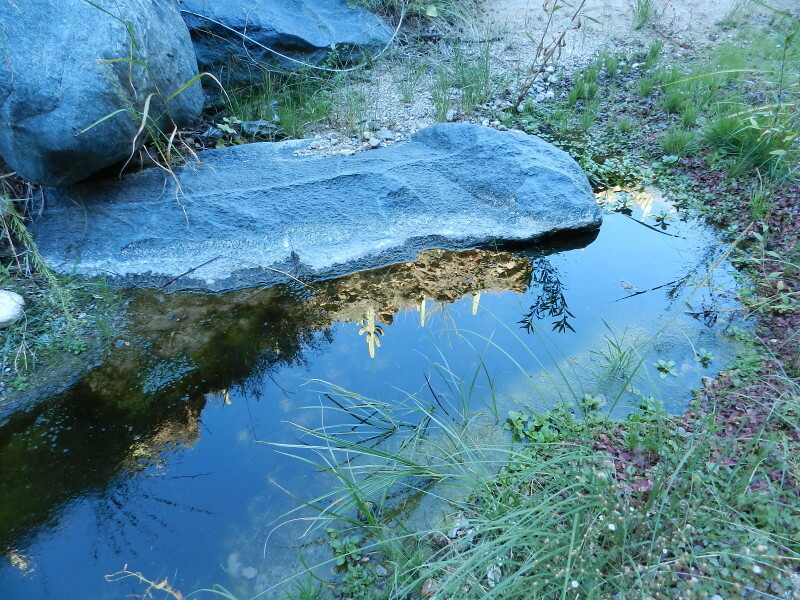 We also want to make the running waterfalls before dark. We take off at a stronger pace. We have to make better time to make our goals. Fewer pictures will be taken. The first thing that DF and I notice is that all of those branches that we had pushed away from us on the way downstream, are now pointing toward us. Past flooding waters have them pointing at us like wispy stakes. Taking care, I step on a rock, not sure that it is stable. It isn’t. It falls under my weight and my footing slides down a couple of feet in a small avalanche. I was ready, just in case, but I can’t help but slam my shin below my knee into a more solid rounded river rock. A scrape, but no bruise for me to continue on with. We make our way back to the easy landmark to find trailhead. A barbed fence is something that is very apparent and not to be missed. 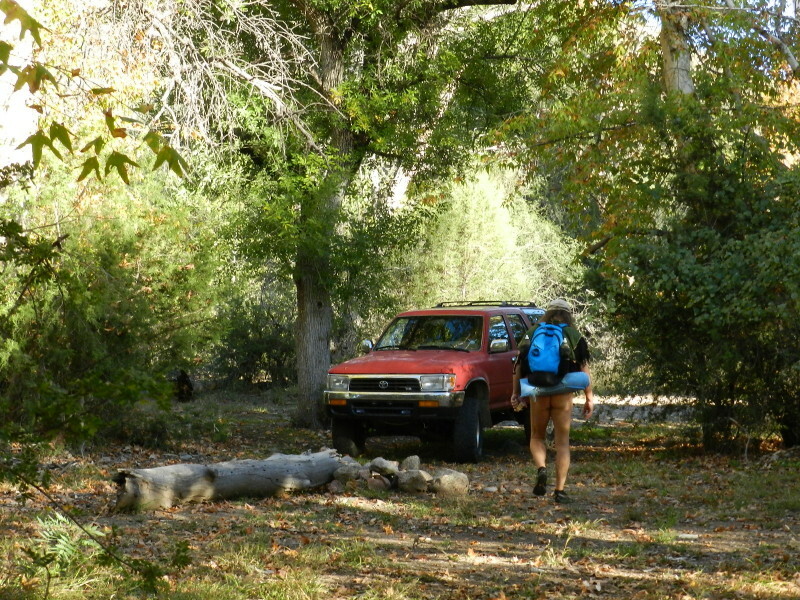 We crawl through and take the short trail directly to the truck. We spare no time getting back to the waterfalls. This day continues next week.